Vatican Deal a New Trial for One Catholic Village in North China - Integration Through Media ....! 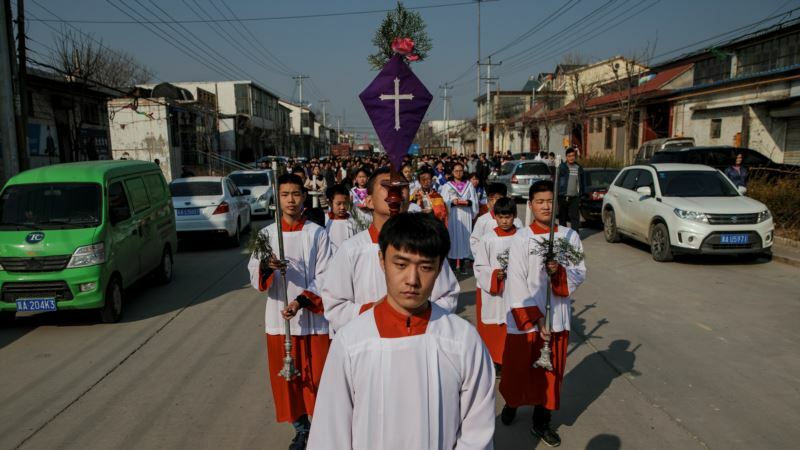 (VOA): Choosing a church can be complicated in China under the rule of the officially atheist Communist Party — especially in Youtong village, where roughly half the 5,000 residents are Catholics. Within a mile radius, the village in northern China's Hebei province hosts a Catholic church sanctioned by Chinese authorities, two large “underground” churches, and numerous smaller unofficial house churches, according to villagers. Youtong provides a snapshot of the muddled and delicate situation for China's estimated 12 million Catholics, with allegiances split between government-sanctioned churches and the underground ones endorsed by the Vatican, amid expectations that a historic accord will soon be struck between Rome and Beijing. The underground churches are generally tolerated but closely monitored by the authorities. House churches tend to be ignored so long as gatherings are small. When Reuters visited Youtong on Good Friday, displays of faith were ubiquitous. Villagers poured into the streets to attend afternoon mass at the official church, whose spire is topped with a large cross that glints in the sunlight high above nearby buildings. Bright red banners with religious slogans, including the Chinese characters for “Emmanuel,” meaning God is with us, or “We have faith in you, Jesus” adorn the gates of many homes. While some Catholics in Youtong told Reuters that a long-awaited agreement could bring clarity and freedom to practice their religion openly, others said they worry the deal will sow further discord in the community. Dong Guanhua, an outspoken priest who sparked controversy in 2016 when he claimed at his underground church that he had been appointed a bishop in a secret ceremony 11 years before, said the deal would push more people to unofficial churches like his. The Vatican has said that it has not authorized Dong's ordination and, if it occurred, it was a breach of church law. “The word 'compromise' sounds good but to some churchgoers it will sound like you are abandoning your faith,” he said. The expected deal would allow China to appoint bishops, in consultation with the Vatican, and could lead to the restoration of full diplomatic ties for the first time in seven decades. On Thursday, the Vatican said an accord on appointing bishops was not imminent but talks were continuing. While relations among the rival churches are cordial, some villagers warned that local schisms could arise from renewed attempts to push together the state-sanctioned Chinese Catholic Patriotic Association, which claims independence from the Vatican, and underground churches loyal to Pope Francis. “Father Dong does not listen to anyone. He has made some people angry. But lots of people like his style, because he tells it like it is,” said a man in his 40s who would only give his surname, Pei, a common name in Youtong. The large tin-roofed underground church of Pei Ronggui, 84, a retired bishop recognized by Rome, has long been the most popular for village Catholics whose loyalty to the Vatican makes them suspicious of the official church, villagers said. Exact numbers were not available, but villagers suggested that the congregations of the official church and Pei's were roughly similar, while Dong attracted slightly fewer. In December 2016, Pei said that Beijing would have to change its attitude toward the Vatican before any deal could work. But Pei, who spent four years in a labor camp after the government raided his church in 1989, appeared to be under pressure from authorities when Reuters recently visited him at home. Pei, who still gives mass and takes confession, was accompanied by a heavyset man, who declined to identify himself, wearing a belt with a police emblem buckle. The man said Pei could not hear well enough to do an interview, ushering him away. The same man then followed Reuters journalists for the next 24 hours, joined intermittently by others in as many as five vehicles, underscoring the sensitivity of the situation. Father Ju Ruibin, at the official church, rescinded an earlier invitation for Reuters to attend Good Friday mass at his church after apparent pressure from the men. The government spokesman's office for Youtong's district did not respond to a faxed request for comment on the unidentified men and restrictions on Catholics in the village. Pei Ziming, a retired wedding officiator, considers the proliferation of churches in the village a boon, enabling him to attend services that fit his schedule.